Chakk... chakk... chakk... chakk... a familiar sound at a kothu parota stall but then, we were not on any road or lane but at the Park Hyatt Chennai, at one of The Flying Elephant's open kitchens, to be more precise. And the sound was coming from behind a glass window that separated the teppan grill from the dining space. 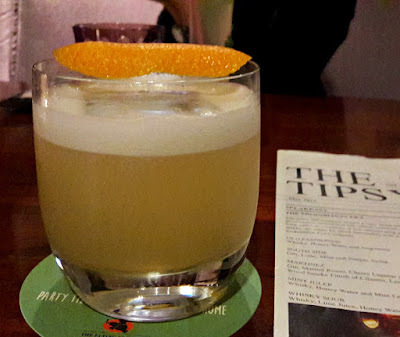 It's Friday night and a little earlier, we had been in the bar. The tabloid menu listed some interesting cocktails. The Whiskey Sour was perfect but I found the Old Fashioned and the Flying Mary - a take on Bloody Mary - a little too strong. Other cocktails we had were Murugan Colada(!! 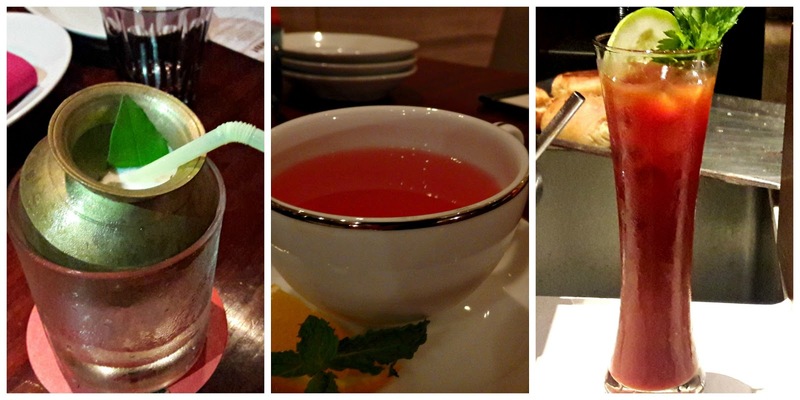 ), complete with a curry leaf and my favourite - vodka-based Very Berry. The dining area was abuzz with diners and foot tapping music. Our group was there to try out the new and compact teppan menu. The tempo of the music picked up and then the service crew on each of the levels stopped doing whatever they were doing and started dancing. Wow! What energy! The music slowed down and everyone got back to work and we crowded around the teppan. It is a large flat iron plate on which food is cooked. It takes a good couple of years to learn the tricks of the trade and the teppan chef is an interesting chap to watch. Food cooked on the teppan is done fast and tastes fabulous. There's no heavy seasoning, just sauces like teriyaki, soy and mirin...and garlic and ginger as well. Assorted Mushrooms has a mix of button, delicate oyster and earthy shiitake. The mushroom textures are interesting and the teriyaki sauce adds its salty sweetness to the taste. Texture comes in the form of crisp millets sprinkled over the top. Peruvian Asparagus has just tender asparagus spears, seaweed and compressed cucumber. 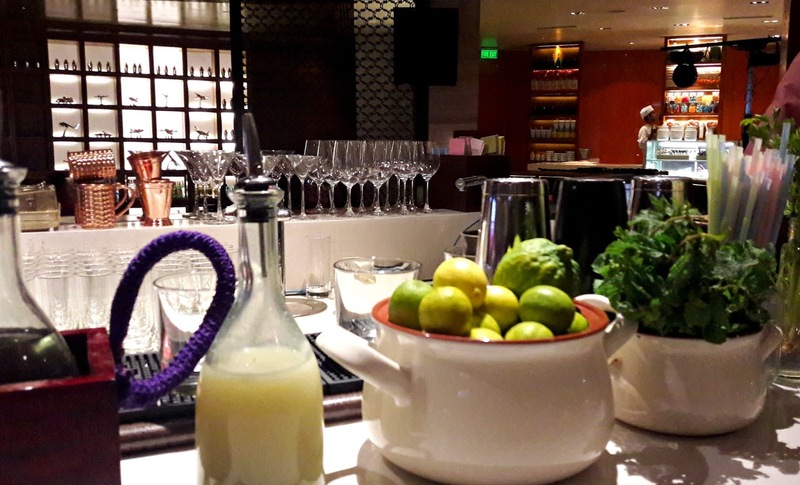 The surprise comes from batons of crisp, sweet Granny Smith apples and the ponzu dressing which adds tang. Asian Greens has kale, pak choy, beans and broccolini. 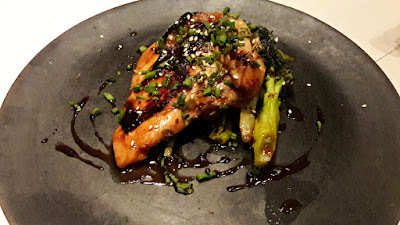 The heat of the teppan had cooked these greens just enough for them to stay crunchy and the ginger sauce was all they needed to take them from plain boring greens to an exotic dish. 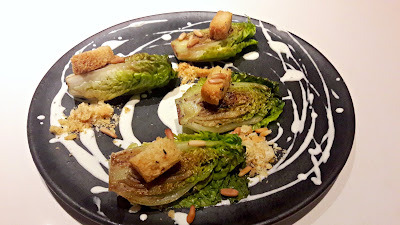 For me, the star dish was Gem Lettuce. 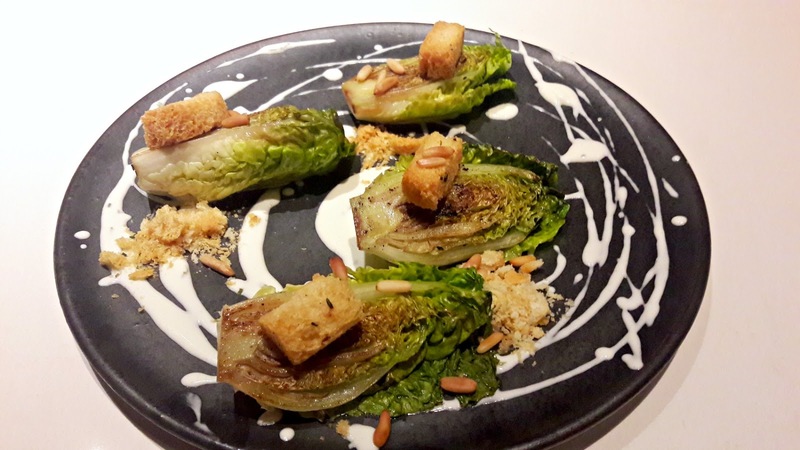 Lightly char grilled lettuce halves had been topped with crisp brioche croutons, a mild goat's cheese dressing drizzled all over with toasted pine nuts for crunch. The flavours were stark but in perfect sync. There was also garlic fried rice where garlic sure made an over-the-top statement and we heard it loud and clear! Of the meat dishes, Tenderloin Tataki was fabulous. Wafer thin slices of meat had been lightly seared and almost melted in the mouth, the ponzu added a burst of tang. The Scampi served with citrus salsa was simply delicious, lightly charred on the high heat of the teppan but still tender and juicy. 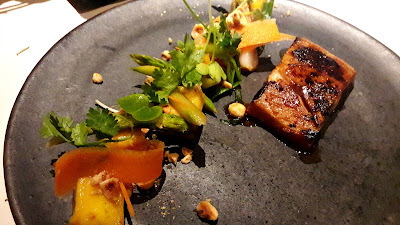 Sea Bass had a miso glaze, mango bits and scallion salad that allowed the fish to come into its own - perfectly cooked, yet moist. The mixed seafood fried rice was the one we had seen Chef Lalit make. Lots of prawn, squid and fish in it and the rice had been seasoned with teriyaki sauce. Loved the flavours and the nutty, firm texture of the rice. There's no special dessert menu but there was a tasting platter of 5 miniature pastries. Each one was fabulous, the pistachio cake pop and the salted caramel profiterole were beyond delicious. 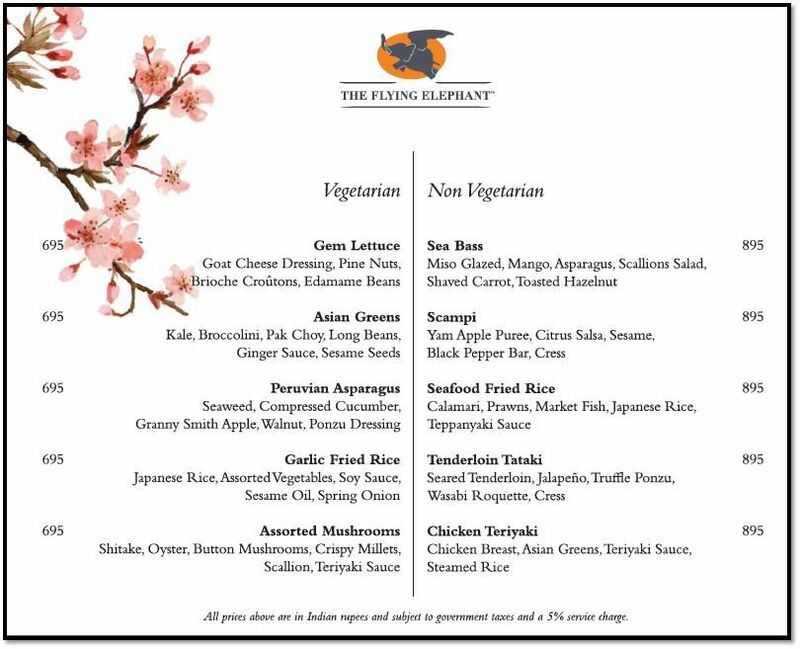 Teppan'd at The Flying Elephant is on till May 29th. Dinner is a la carte and prior reservation is recommended.